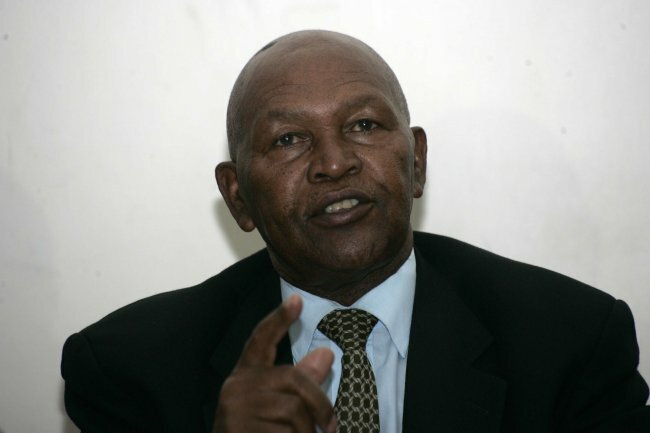 Dr Kipchoge Keino, the head of the disbanded National Olympics Committee of Kenya, NOCK is expected back in the country on Monday from the U.S.
Kipchoge who was in Rio with team Kenya flew to the U.S. for his son’s wedding and has been missing in action, since the Minister disbanded the NOCK last Wednesday and the police raid at the Olympic offices along Mombasa road two days later. What followed was a series of arrests of the NOCK Secretary General Francis Paul, Assistant Treasurer of NOCK, Stephen Arap Soi who was also the head of team Kenya at the Rio 2016, James Chacha who was the Executive Officer of the delegation to Brazil and the General Team Manager Pius Ochieng’, who was in charge of the distribution of the controversial Nike kits that athletes complained were never dispersed in totality. There were also concerns over the Accreditation of officials and air tickets for the athletes and their coaches. The distribution of the Nike kit, part of which was impounded when the NOCK offices were raided on Friday, could form the basis of investigations into the Rio scandal, with the arrested officials allegedly facing charges ranging from giving false information to false inventory information. There were fears that the head of NOCK a legendary athlete and respectable member of the Olympic family could be arrested on arrival, but Sports News Arena understands that he is reportedly expected to meet President Uhuru Kenyatta for a detailed brief on the happenings at Rio. The meeting could also dictate the next cause of action by the International Olympic Committee, IOC, who have been following and assessing the situation, with the hope that upon his return to Nairobi Kipchoge can impress on the state to rescind its decision to dissolve the NOC. Kipchoge is a honorary member of the IOC where he sits alongside former world marathon record holder Paul Tergat, who serves as a member of the excusive club of world sports. The IOC does not condone government interference in the operations of its 206 NOC affiliates, which is clearly stipulated in its Olympic charter. But the IOC is always slow to suspend and has often sought to engage the government of any of its affiliate members that gets involved with the operations of the NOC before taking any decision as listed in article 27 part nine. “…In the case of infringement of the Olympic Charter, the IOC Executive Board may take any appropriate decisions for the protection of the Olympic Movement in the country of an NOC, including suspension of or withdrawal of recognition from such NOC if the constitution, law or other regulations in force in the country concerned, or any act by any governmental or other body causes the activity of the NOC or the making or expression of its will to be hampered.The IOC Executive Board shall offer such NOC an opportunity to be heard before any such decision is taken." If the talks fail that is when the IOC would propose the suspension of the NOCK to its its Executive Board Meeting on 6-8 of December in Lausanne.